It has been a long time since I posted a blog update…. Between the mad rush before the holidays and the impressively cold weather we are having here in Michigan, I have either been short on free time, or short on shop time. But I wanted to post a write up for my fellow woodworkers – a blog post about a monumental day in the life of a woodworker that all of us can relate with. This monumental event – the day that I bought my first BRAND NEW power tool! Everything that I have bought to date has been used. Used tools can be a great buy but sometimes you just want to go new. So I’m dedicating this lengthy post to help aspiring wood workers understand what my thinking was going into this purchase. First, what did I buy? 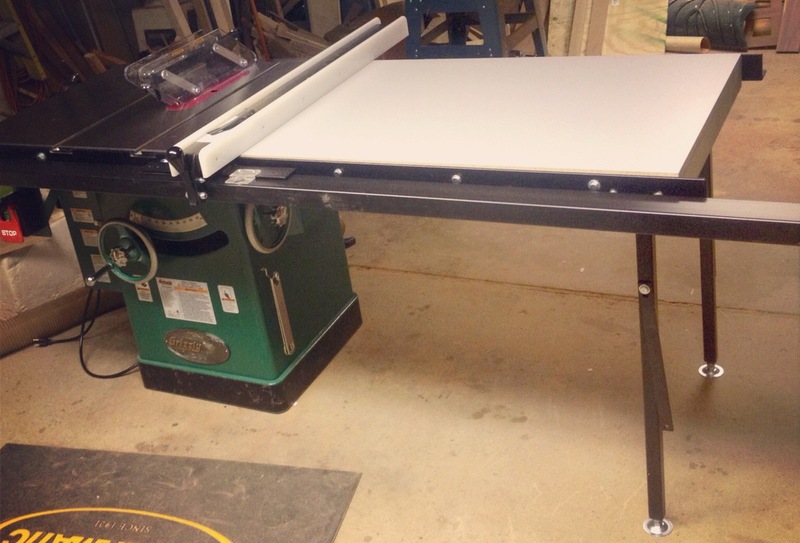 A 10” table saw from Grizzly Tools, specifically the G1023RLX 10” 3HP Left Tilting Cabinet Saw. Second, why did I want a new saw? There are several reason for this. First, I wanted a more powerful saw. I have been cutting a lot of really thick and dense hardwoods and the older saw with a 1.5HP motor couldn’t handle long rips of this thick material. I changed to a thin kerf blade, but then the cut quality suffered. The new saw did require me to run a 220 volt outlet though. Another reason for the upgrade was that I wanted to have a saw that came with a riving knife, for the additional safety. The final reason for wanting a new saw was for the improved dust collection that a cabinet saw offers. Also, I went with the RLX to have the additional table length to handle sheet goods, should the need arise, and a place to mount router, for a router table. Your mileage may vary. Third, why did I choose this specific saw? This needs to be broken down into to why the company I picked and then why this saw. First, the company. I chose Grizzly based on how I perceive their overall tool value. In other words, their tools tend to be less expensive than some of the other big name woodwork tool company’s, while still maintaining good quality. This is an issue that can of course be debated and disagreed with, but in my year long research for new tables saw I have found mostly good things about the quality of their tools. It also seems that most of the naysayers haven’t actually used/owned one of the Grizzly brand tools and they are going off the negative perceived value of overseas made tools. News flash: a large majority of tools are made over sea nowadays. Some of the “higher end” tools have some striking similarities to these tools, except maybe for the color. So bottom line, for me, it was a “value for the money” purchase. Secondly, why specifically the G1023RLX over other Grizzly saws. Grizzly has large variety of saws but if you want a 10” cabinet then you are looking at one of the G1023’s or the G0691’s (or shorter rip G0690). There is a third option but it seems sort of out of place compared to the other ones, both in cost and features. From what I gather the G0691’s big advantage was that it had a riving knife and a Lesson 3HP motor – that would have sealed the deal for me. But now the G1023 comes with a riving knife, so that leveled the playing field. So without going through a side by side comparison of all the feature and spec on each saw, I tell you why I picked the 1023. It really came down to the fact that this saw uses a serpentine belt system rather than the triple belt system on the G0691. I like the idea of fewer parts and feel that in this case simpler is better. The G1023 offers dust collection at the blade, but the G0691 doesn’t – every little bit of dust collection helps. The other difference that didn’t really factor in, but could be mentioned are that the G1023 offer 53” of rip capacity compared to 50” and the dust collection hook up is on the back rather than the side. Neither of these are deal breakers, but both worked to my advantage in this case. In my opinion the only clear advantage to the G0691 is the name brand motor, oh and the color if you like the white over the green. Setting up the saw out of the box was pretty straight forward, the directions weren’t bad, but it is heavy so have a helper! The blade stops came setup to a perfect 0 and 45 degrees to the table and was parallel to the miter tracks, so that eliminated some fuss up front. The saw run strong and smooth with little vibration. I haven’t used the saw as much and I would have liked by now but overall I’m very happy with it. The one thing I am disappointed with is the dust collection at the blade. I don’t really feel like it does much to collect the dust! I also found that the hose can become clogged very easily with small cutoffs, so a Zero Clearance insert is a MUST. Thanks for reading, and if you work for Grizzly I’ll take a discount off the 15” planer that I hope to purchase this year!